The Tourism Authority of Thailand (TAT) had announced the official events scheduled for 2018 Chiang Mai’s Loy Krathong and Yee Peng Lantern Festivals. Chiang Mai, the Northern Province of Thailand, will be celebrating Loy Krathong and Yee Peng Lantern Festivals from 20 ~ 23 November 2018. 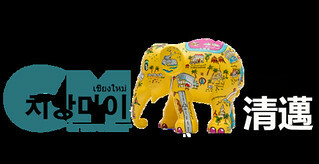 Thousands of visitors will be flocking to Chiang Mai to be part of these much-anticipated annual festivals. There will be the official governmental ceremonies and celebrations, along with many other private events giving everyone in Chiang Mai the opportunity to see and experience it all. Read: 6 Places To See the 2018 Loy Krathong & Yee Peng Lantern Festivals in Chiang Mai, Thailand. 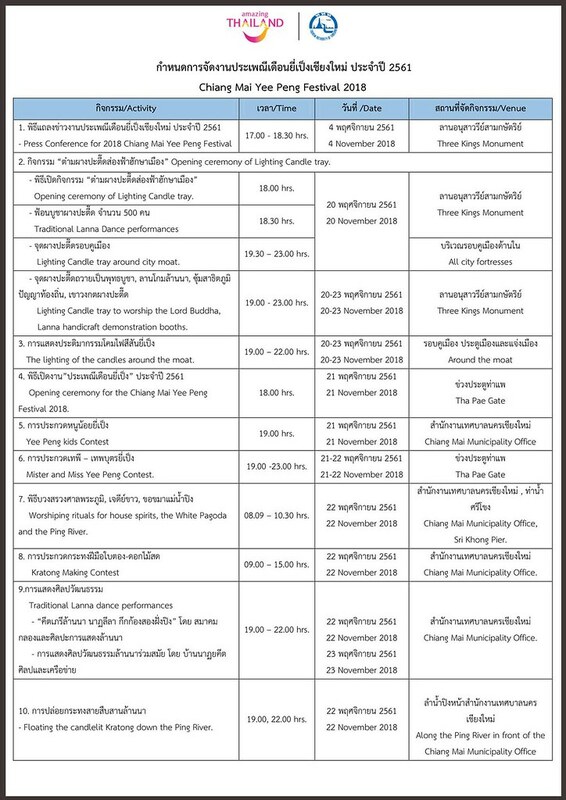 The following information lists the government’s event and ceremony scheduled around Chiang Mai in celebration of the 2018 Loy Krathong and Yee Peng Festivals. Lanterns at The Three Kings Monument hung out for the Loy Krathong and Yee Peng Festivals. 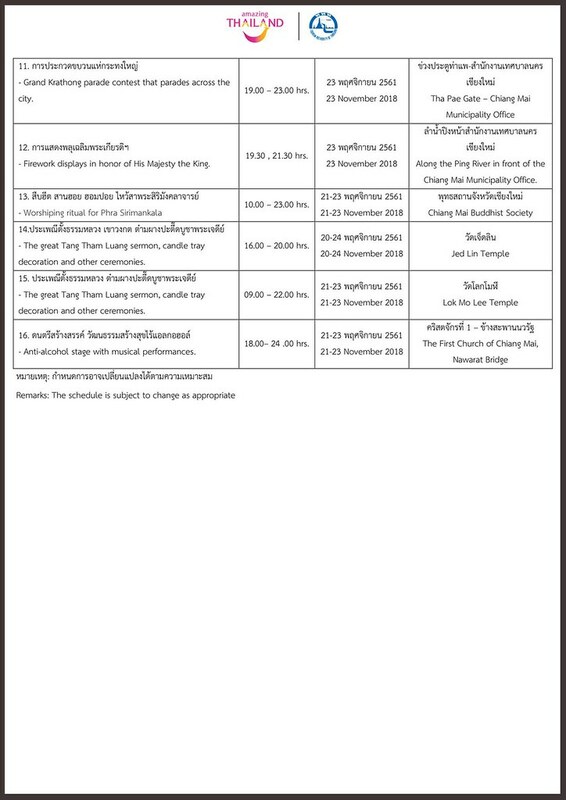 Events Schedule for 2018 Loy Krathong & Yee Peng Festivals in Chiang Mai, Thailand. The opening ceremony of Lighting Candle Tray, with traditional Lanna dance performances at The Three Kings Monument. Lighting candle trays around city moat at all city fortresses. Lighting candle trays to worship the Lord Buddha, at The Three Kings Monument. Also displayed here booth demonstrating Lanna handicraft. Lighting of candle trays and lanterns at The Three Kings Monuments. The opening ceremony for Chiang Mai Yee Peng Festival 2018 at Tha Pae Gate. Yee Peng Kids Contest, at Chiang Mai Municipality Office. Mister and Miss Yee Peng Contest, at Tha Pae Gate. The Krathong making contest, at Chiang Mai Municipality Office. During Loy Krathong and Yee Peng Lantern Festivals, you’ll see locals’ homes and public places decked out in colourful hanging lanterns and flag decorations. Worshipping ritual to House Spirits, White Pagoda and Ping River, at Chiang Mai Municipality Office, Sri Khong Pier. Floating the candlelit Krathong down the Ping River, along the Ping River in front of the Chiang Mai Municipality Office. Traditional Lanna Dance Performance, at Chiang Mai Municipality Office. Fireworks displays, along the Ping River in front of the Chiang Mai Municipality Office. Head to Ping River, along the Chiang Mai Municipality Office to float Krathong down the river. Grand Krathong Parade contest that parades across the city, starting from Tha Pae Gate to the Chiang Mai Municipality Office. Respective ritual ceremonies for Phra Skrimangkalajarn, at Chiang Mai Buddhist Society. The Great Tang Tham Luang Sermon, candle tray decoration and other ceremonies, at Wat Lok Moli. The Krathong Grand Procession across the city of Chiang Mai. The Great Tang Tham Luang Sermon, candle tray decoration and other ceremonies, at Wat Jed Lin. Stage musical performance, at The First Church of Chiang Mai, Nawarat Bridge. The Great Sermon will be hosted at several temples in Chiang Mai city.